Apart from making a wedding that we have all been awaiting, we are crushing on these sweet moments from Flavia Tumusiime and Andrew Kabura’s wedding. The two are clearly smitten with each other and My Wedding brings you a sneak peek into their lovely function. 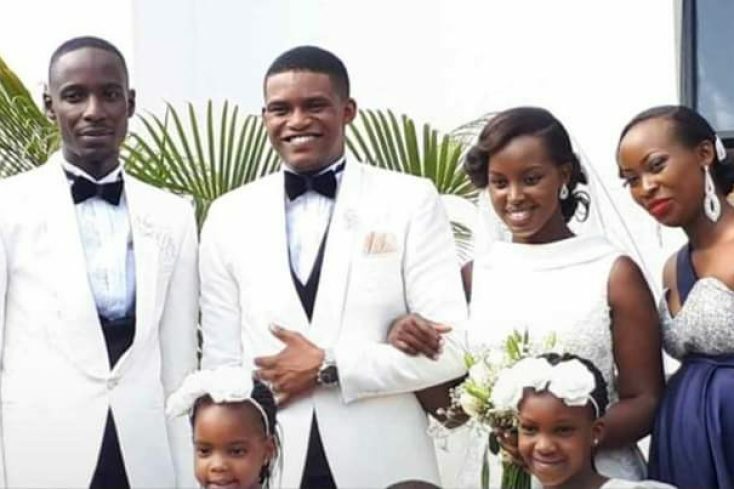 This Video shows an evidently happy Andrew Kabura holding onto an equally joyful Flavia Tumusiime, now Mrs Kabura after being announced husband and wife at All Saints Cathedral, Nakasero . The church choir sings Michael Will Smith’s Mighty to Save as the couple happily walks in between the church pews. Wherever Kabura turns, he hi-fives his guests, showing off his new beloved wife. He even gives off a thumb sign at a certain time, as if to say; it is well with him. The guests also look caught up in the ambiance of celebration as they keep ululating and smiling, clearly happy for the couple. And what is a reception without a Davido song like? The Kaburas were not about to be the answer to that question. The couple went fully blown as they made a grand reception entrance on Davido’s Aye, which of course has to unleash their African dance skills and vigor. Well, African they are and dance they did. This video shows Kabura entering the reception, hand on bride as he feels the beat. Flavia, not about to let him take the whole show pulls off some moves of her own, even going down at some point. Well, if that is not celebration, we do not know what is. It’s speech time and although we missed Kabura’s speech, we know that it was quite a speech that Flavia decided to abandon her written piece and instead speak from her heart. The body language from the couple is simply goals. We even get a glimpse of Kabura’s glittery ring. My Wedding wishes the couple a beautiful marriage.